Over time, chav’rutah study has become a staple of Jewish teaching. While it is possible to study Jewish texts alone, the Rabbis encouraged chav’rutah study. 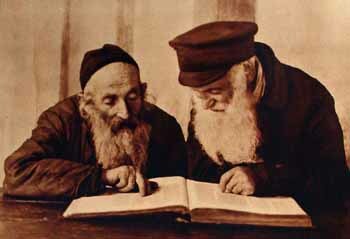 They argued that without someone to discuss the text with, one would become stupid (Talmud Berakhot, 36b). Learning with another person can create conflict around what a text means, and Judaism thrives off of disagreements over interpretation. The Talmud bursts with disagreements and arguments between Rabbis. One of the most famous continual disagreements is between Shammai and Hillel. They learn together, yet always have different interpretations of laws. On some, they make compromises, on others they agree to disagree, and we tend to follow Hillel’s rulings. However, without the discussion and challenge of views, Judaism would not be where it is now. In today’s religious school classrooms, we may not be doing intensive Talmud study like the Rabbis, but we are still engaging in Jewish study. The practice of chav’rutah study is just as important today as it was at the time of the Rabbis. We can use chav’rutah as a way to engage in a text study, reading a textbook, or simply discussing a prompt. We can begin learning in chav’rutah, and then have a whole class discussion on what we discussed. Or, we can flip it and first have a classroom broader discussion and then break into chav’rutah. The possibilities are endless. Not only has learning through teaching been proven to be successful, but it also stays true to the practices beginning with the start of Rabbinic Judaism.